Everyone in my family has drunk my Kool-Aid, so to speak. My husband and my teenage daughters all have bought into my way of eating for the most part, understanding the connection between what they eat and how they feel (and in the case of my daughters, how they look.) Although my 11-year-old son, whom I lovingly refer to as Mr. Picky, has been a little slow coming around. My son quietly wishes I was a “cool mom.” You know, the kind that buys “unhealthy food,” as he calls it. Believe me when I say that he is not deprived of treats. I know enough not to be one of those parents who prohibits her children from eating a grain of sugar or a not-homemade graham cracker. But there are certain food substances that do not cross my front door. Ever. One of those is artificial colors. So when my son asks me “why can’t we have ____?” (insert disaster-packaged-food-marketed-to-kids), I usually go on about why those food-like impostors are bad for our health or I just say, “because I love you too much.” And he rolls his eyes. There is less eye-rolling than he did a year ago, but that still annoys him. So just before dropping my sweet boy off at sleepaway camp for 13 whole days, my husband was reminding him to shower (going in a pool or a lake doesn’t count) and brush his teeth, use sunscreen and keep hydrated. As soon as I opened my mouth, Mr. Picky looked at me and said, “Don’t worry, Mom. I got it. Don’t forget to eat protein. No high-fructose corn syrup and not too much junk food.” Of course, I was like, “What? I wasn’t going to even mention food. Have the best time! Love you so much!” Busted. 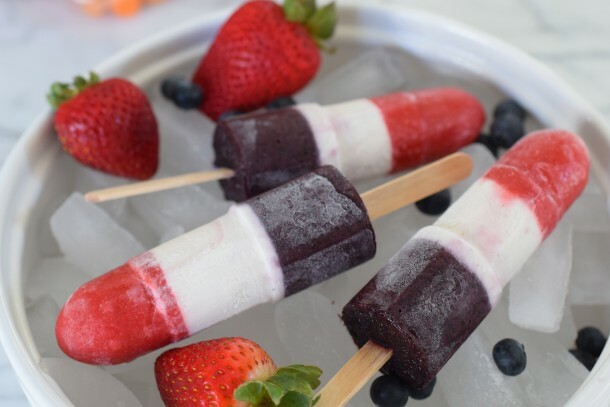 Because Mr. Picky will be at camp on the 4th of July, I surprised him the other day with these red, white and blue popsicles. Of course they are all natural. But really natural, not like the “natural” food companies liberally use when marketing many products. I had no idea if they were going to turn out good or boring or what. I mean after all, they’re made out of …fruit. What a concept. And some coconut milk sweetened with honey. Zzzzzzzzzzz……. 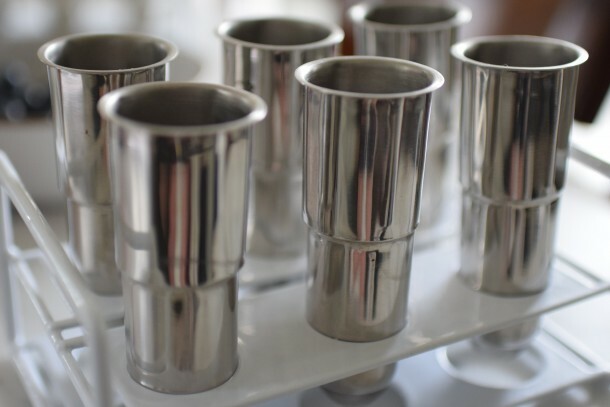 I personally think these are very exciting and the perfect answer to Bomb Pops, especially if you use these cool stainless steel popsicle molds which you can find here. 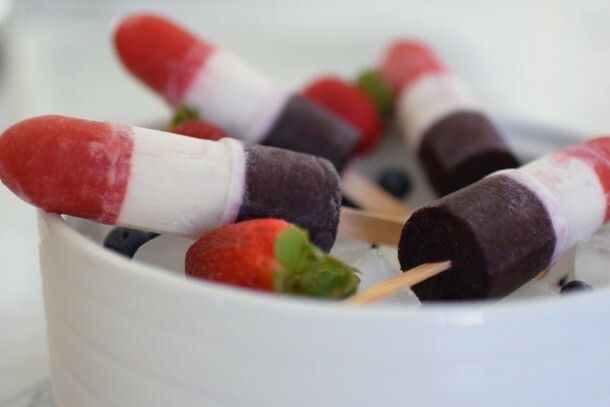 I tasted each mixture before freezing to make sure the sweetness was just right, otherwise these are very straightforward and you can make them today for the 4th if you want. They were a huge hit with all my kids, including Mr. Picky! My girls thought they tasted like a really fresh-tasting sorbet. My son gave me such a nice compliment when he said, “Wow, Mom. These are actually pretty good.” And then he had a second one. I miss him already. Place strawberries in blender or food processor and blend until you achieve a liquid consistency. Pour into bottom third of popsicle mold. Insert stick. Place in freezer for approximately 1 hour, or until frozen solid. Combine coconut milk, vanilla and honey in a measuring cup or a bowl with a spout. 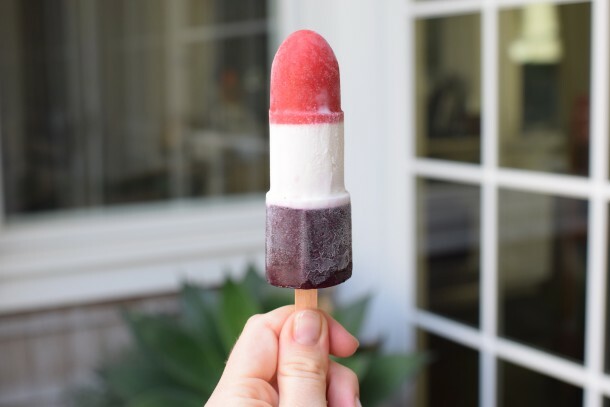 Remove popsicle mold from the freezer and pour the coconut layer on top of the frozen strawberry layer leaving the last third of the mold empty. Place back in the freezer and freeze for about 30-45 minutes until coconut mixture is firm, but it doesn’t have to be frozen solid. Place popsicle sticks in coconut mixture and put back in the freezer until completely frozen. Place blueberries in a blender or food processor and blend until you achieve a liquid consistency. 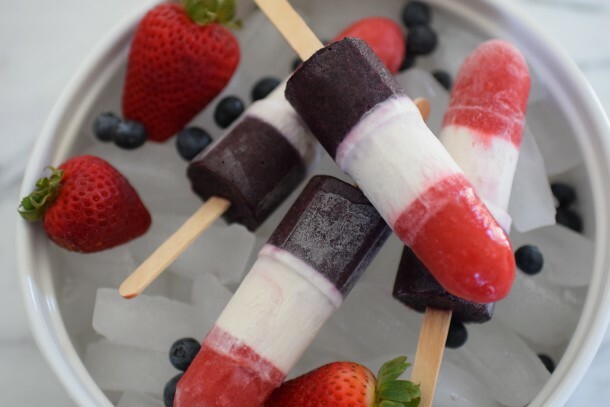 Remove popsicle mold from the freezer and pour blueberry mixture into top third of mold, over the frozen coconut mixture. Place back in the freezer for another hour or until completely frozen solid. To remove from popsicle mold, gently run mold under warm water to release. 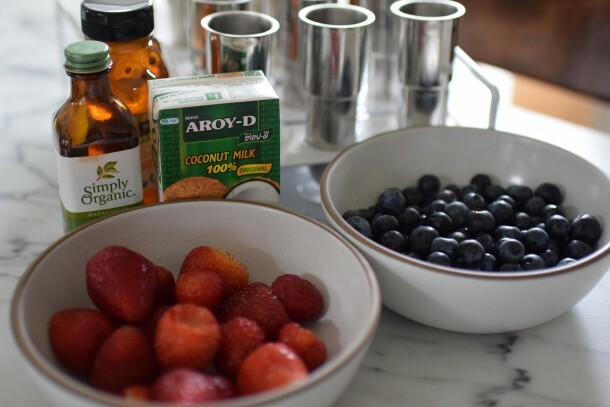 *Make sure to taste your fruit mixture first, if your fruit isn’t super sweet or you prefer a sweeter popsicle, feel free to add honey (or sweetener of choice) to taste to the fruit mixtures. They are yummy and easy! You are a good mama and a role model for other moms who need the inspiration to stand up to packaged food manufacturers. No one cares about your kids the way you do. Stick with it. They will so appreciate it later! Where do you get the molds from?? Thank you they look great!! I bought them on amazon. The link is in the fifth paragraph above :).